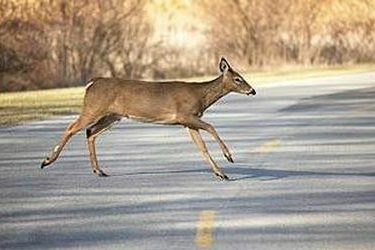 A Hugoton man was injured in a crash involving a deer. The accident occurred on Tuesday, December 22, at 3:19pm on 132 Road, 3.4 miles north of Bucklin. A 2004 GMC Yukon being driven by Carlon Alberty Jr., 27, of Hugoton was northbound on 132nd Road when a deer came into the roadway. Alberty slammed on his breaks to avoid the deer causing his vehicle to roll 3/4 times, ending up on the passenger side in the east ditch. Alberty was taken to Western Plains Regional Hospital to be treated for his injuries. Seatbelts were in use at the time of the accident.